Süßwassertang, a popular aquatic plant that is sold worldwide in aquarium markets, has been long considered a liverwort because of its ribbon-like thallus. However, its antheridia are remarkably fern-like in morphology. To corroborate the hypothesis that Süßwassertang is a fern gametophyte and to determine its closest relative, we have sequenced five chloroplast regions (rbcL, accD, rps4–trnS, trnL intron, and trnL-F intergenic spacer), applying a DNA-based identification approach. The BLAST results on all regions revealed that Süßwassertang is a polypod fern (order: Polypodiales) with strong affinities to the Lomariopsidaceae. Our phylogenetic analyses further showed that Süßwassertang is nested within the hemi-epiphytic fern genus Lomariopsis (Lomariopsidaceae) and aligned very close to L. lineata. Our study brings new insights on the unexpected biology of Lomariopsis gametophytes—the capacity of retaining a prolonged gametophytic stage under water. It is of great interest to discover that a fern usually known to grow on trees also has gametophytes that thrive in water. 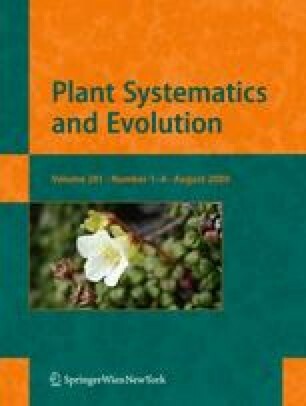 The authors thank Li-Yaung Kuo for laboratory help, Tien-Chuan Hsu for collecting Taiwanese Lomariopsis spectabilis, and Dr. Wen-Liang Chiou (Taiwan Forestry Research Institute) for valuable comments. Voucher information and GenBank accession numbersa for rbcL, accD, trnL-F and rps4 (plus rps4-trnS IGS) sequences used in this study. Taxon—GenBank accessions: rbcL, accD; voucher (collection locality; herbarium) or reference. Arachniodes aristata (G.Forst.) Tindale—AB232490, AB232418; Tsutsumi and Kato 2006. Araiostegia faberiana (C.Chr.) Ching—AB212688*; Tsutsumi and Kato 2005. Arthropteris backleri (Hook.) Mett.—AB212686*; Tsutsumi and Kato 2005. Athyrium niponicum (Mett.) Hance—AB232413, AB232441; Tsutsumi and Kato 2006. Bolbitis repanda (Blume) Schott—AB232399, AB232427; Tsutsumi and Kato 2006. Colysis wrightii (Hook.) Ching—AB232406, AB232434; Tsutsumi and Kato 2006. Crypsinus enervis (Cav.) Copel.—AB232407, AB232435; Tsutsumi and Kato 2006. Ctenitis eatonii (Baker) Ching—AB232391, AB232419; Tsutsumi and Kato 2006. Cyclopeltis crenata (Fée) C. Chr.—DQ054517+; Li and Lu 2006. Cyclopeltis crenata (Fée) C. Chr+, EU216746; F. W. Li 568 (private garden, originally from Thailand; TAIF). Davallia formosana Hayata—AB212704*; Tsutsumi and Kato 2005. Dryopteris erythrosora (D.C.Eaton) Kuntze—AB232392, AB232420; Tsutsumi and Kato 2006. Elaphoglossum callifolium (Blume) T.Moore—AB232400, AB232428; Tsutsumi and Kato 2006. Goniophlebium persicifolium (Desv.) Bedd.—AB232408, AB232436; Tsutsumi and Kato 2006. Grammitis reinwardtii Blume—AB232398, AB232426; Tsutsumi and Kato 2006. Gymnogrammitis dareiformis (Hook.) Ching ex Tardieu and C.Chr.—AB232409, AB232437; Tsutsumi and Kato 2006. Hypodematium crenatum (Forssk.) Kuhn ssp. fauriei (Kodama) K.Iwats.—AB232414, AB232442; Tsutsumi and Kato 2006. Leucostegia immersa (Wall. ex Hook.) C.Presl—AB232388, AB232416; Tsutsumi and Kato 2006. Leucostegia pallida (Mett.) Copel.—AB232389, AB232417; Tsutsumi and Kato 2006. Lomariopsis marginata (Schrad.) Kuhn.—AY818677, NA; Skog et al. 2004. Lomariopsis sp. (Süßwassertang)—EU216743, EU216744; F. W. Li 569 (unknown origin; TAIF). Lomariopsis sp. (Süßwassertang) —AM946394+; F042 (unknown origin; SING). Lomariopsis spectabilis (Kunze) Mett.—AB232401, AB232429; Tsutsumi and Kato 2006. Loxogramme avenia (Blume) C.Presl—AB232410, AB232438; Tsutsumi and Kato 2006. Matteuccia struthiopteris (L.) Tod.—AB232415, AB232443; Tsutsumi and Kato 2006. Microsorum zippelii (Blume) Ching—AB232411, AB232439; Tsutsumi and Kato 2006. Nephrolepis acuminata (Houtt.) Kuhn—AB232403, AB232431; Tsutsumi and Kato 2006. Nephrolepis cordifolia (L.) C.Presl—AB232404, AB232432; Tsutsumi and Kato 2006. Oleandra pistillaris (Sw.) C.Chr.—AB232405, AB232433; Tsutsumi and Kato 2006. Oleandra wallichii (Hook.) C.Presl—AB212687*; Tsutsumi and Kato 2005. Polybotrya caudata Kunze—AB232393, AB232421; Tsutsumi and Kato 2006. Polystichum fibrilloso-paleaceum (Kodama) Tagawa—AB232394, AB232422; Tsutsumi and Kato 2006. Pyrrosia rasamalae (Racib.) K·H.Shing—AB232412, AB232440; Tsutsumi and Kato 2006. Quercifilix zeylanica (Houtt.) Copel.—AB232395, AB232423; Tsutsumi and Kato 2006. Rumohra adiantiformis (G.Forst.) Ching—AB232396, AB232424; Tsutsumi and Kato 2006. Tectaria phaeocaulis (Rosenst.) C.Chr.—AB232397, AB232425; Tsutsumi and Kato 2006. Teratophyllum wilkesianum (Brack.) Holttum—AB232402, AB232430; Tsutsumi and Kato 2006. Taxon—GenBank accessions: trnL-F; voucher (collection locality; herbarium) or reference. Lomariopsis: L. amydrophlebia (Sloss. ex Maxon) Holttum—DQ396555; Rouhan et al. 2007. L. boivinii Holttum—DQ396557; Rouhan et al. 2007. L. cordata (Bonap.) Alston—DQ396558; Rouhan et al. 2007. L. crassifolia Holttum—DQ396559; Rouhan et al. 2007. L. guineensis (Underw.) Alston—DQ396560; Rouhan et al. 2007. L. hederacea Alston—DQ396561; Rouhan et al. 2007. L. jamaicensis (Underw.) Holttum—DQ396562; Rouhan et al. 2007. L. japurensis (Mart.) J. Sm.—DQ396567; Rouhan et al. 2007. L. kunzeana (Underw.) Holttum—DQ396570; Rouhan et al. 2007. L. latipinna Stolze—DQ396571; Rouhan et al. 2007. L. lineata (C. Presl) Holttum—DQ396572; Rouhan et al., 2007. L. longicaudata (Bonap.) Holttum—DQ396573; Rouhan et al. 2007. L. madagascarica (Bonap.) Alston—DQ396576; Rouhan et al. 2007. L. mannii (Underw.) Alston—DQ396577; Rouhan et al. 2007. L. marginata (Schrad.) Kuhn—DQ396579; Rouhan et al. 2007. L. maxonii (Underw.) Holttum—DQ396580; Rouhan et al. 2007. L. muriculata Holttum—DQ396582; Rouhan et al. 2007. L. nigropaleata Holttum—DQ396584; Rouhan et al. 2007. L. palustris (Hook.) Mett. ex Kuhn—DQ396585; Rouhan et al. 2007. L. pervillei (Mett.) Kuhn—DQ396587; Rouhan et al. 2007. L. pollicina Willem. ex Kuhn—DQ396588; Rouhan et al. 2007. L. prieuriana Fée—DQ396590; Rouhan et al. 2007. L. recurvata Fée—DQ396592; Rouhan et al., 2007. L. rossii Holttum—DQ396594; Rouhan et al. 2007. L. salicifolia (Kunze) Lellinger—DQ396595; Rouhan et al. 2007. L. sp.—DQ396602; Rouhan et al. 2007. L. sp.—DQ396601; Rouhan et al. 2007. L. sp.—DQ396603; Rouhan et al. 2007. L. sp. (Süßwassertang)—EU216745; F. W. Li 569 (unknown origin; TAIF). Lomariopsis sp. (Süßwassertang) —AM946393; F042 (unknown origin; SING). L. spectabilis—EU216748; F.W. Li 567 (Wulai, Taiwan; TAIF). L. vestita E. Fourn.—DQ396598; Rouhan et al. 2007. L. wrightii Mett. ex D. C. Eaton—DQ396600; Rouhan et al. 2007. Cyclopeltis crenata (Fée) C. Chr.—EU216746; F. W. Li 568 (private garden, originally from Thailand; TAIF). Hypodematium crenatum (Forssk.) Kuhn—AF425122; Smith and Cranfill 2002. Lomariopsis sp. (Süßwassertang) — AM947063; F042 (unknown origin; SING). aAsterisk, The same accession as previously noted; cross, this sequence is available in a different voucher but the same taxon; NA, data are not available for this taxon.